Mugen are proud announce that Tomas Engström finished third in both European Touring Car Cup races at Salzburgring. “I do of course always want to win, but I am happy with third,” said Tomas Engström. 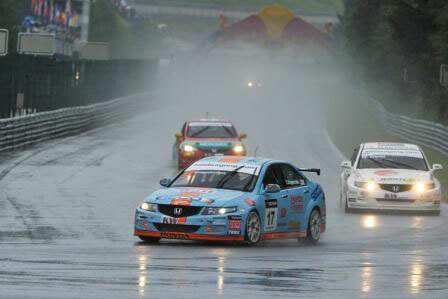 The ETCC races in Austria proved to be a challenge with torrential rain and a very slippery track. “I could barely see a thing because of the spray on the windscreen. We were doing about 240 km/h and I wasn’t even able to see the white lines along the edge of the track. I had to back off to get a gap to see anything at all,” said Tomas Engström. “We haven’t been fast in the rain in previous wet races. That is not the case any more, the car is brilliant in the wet now. We also proved that we are quick in the dry and it is nice to show that with all our hard work, there are still things that can be improved and developed with the Accord,” said Engström.